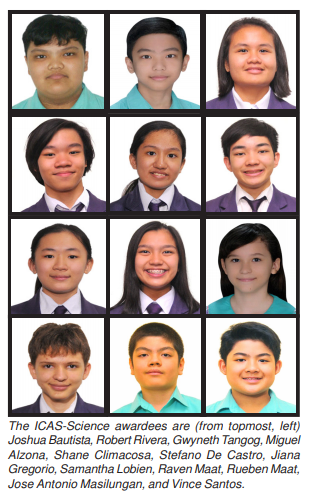 Students of Southville International School and Colleges (SISC) received awards in the 2018 International Competitions and Assessments for Schools (ICAS) – Science that drew over one million student entries from more than twenty countries. Ervin Joshua Bautista of Gr. 6 – Perseverance, Robert Jeremiah Rivera of Gr. 7 – Resilience, and Gwyneth Margaux Tangog of Gr. 9 – Compassion were awarded the High Distinction Certificate for placing in the top 1% of all participants in their level. Additionally, Robert Jeremiah Rivera will be awarded a medal and a medal winner’s certificate for getting the top score of his level. – Resilience, Rueben Maat of Gr. 10 – Commitment, Jose Antonio Masilungan of Gr. 6 – Perseverance, and Vince Santos of Gr. 6 – Perseverance. Conducted by Educational Assessment Australia of the University of New South Wales in Sydney, the skills-based assessments with a competition element evaluated the participants’ skills, knowledge and understanding in Earth Sciences and Astronomy, Chemistry, Biology and Ecology, and Physics.